The cloud has a perception problem. It’s proven to be an invaluable tool and is expected to handle 83% of enterprise workloads in 2020, but a nagging idea still persists: cloud systems are less secure than their on-premise counterparts. Cloud provider’s retain the capacity to help your project go live as soon as your applications are built. On-premise systems, however, could take months to prepare. Often, you can put management of your cloud in the hands of a software developer. The cloud provider has the people and resources to ensure your infrastructure is running effectively and with negligible downtime. Scaling a data center can be a costly prospect. It takes many resources and you’d still end up paying more than you’d like, even when usage is low. Cloud services provide automated scaling to account for usage and charge you the lowest prices in high and low usage times. The cloud also provides ease of access, mobility, and other benefits. Ultimately, the potential value depends on your enterprise’s operations and requirements. Just because the cloud has so many benefits doesn’t mean it’s the right solution for your business, so it will take an in-depth analysis to determine if it’s right for your enterprise. 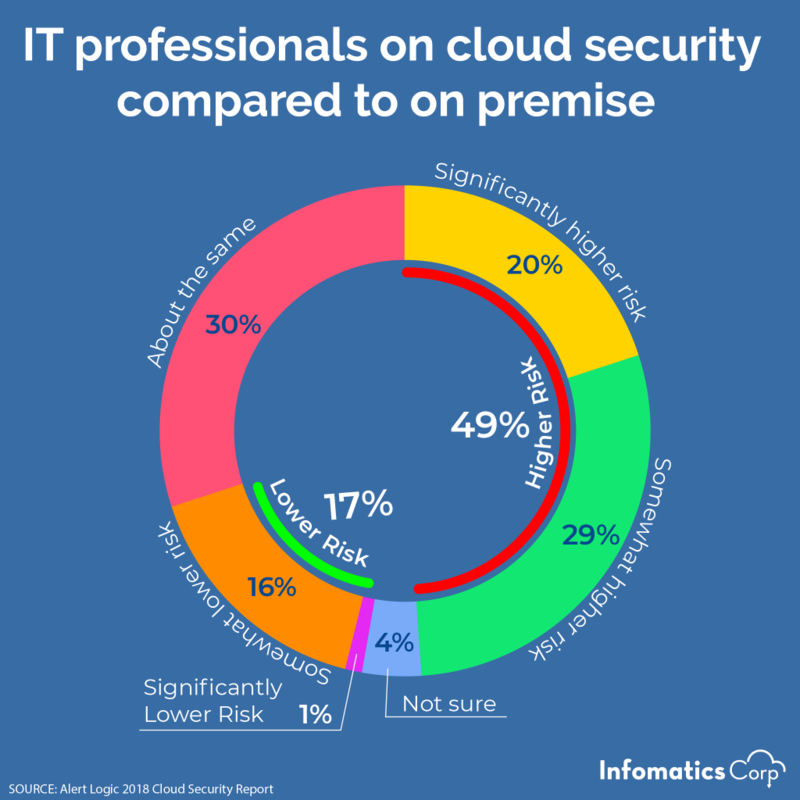 Where does cloud security stand? IT professionals are still uncertain about cloud security. Alert Logic found that 49% of IT professionals believe that the cloud has a higher risk of cloud breaches than on-premise systems. A big part of this fear is the idea of turning part of their security operations over to cloud providers. However, this fear is often unfounded. Cloud providers focus more on security than most enterprises will ever be able to. While you’re juggling multiple IT needs, cloud providers like AWS are focusing on optimizing their infrastructure, even publishing industry-leading security research. That’s why Gartner predicts that public cloud as an infrastructure workloads will suffer at least 60% fewer security incidents than those in traditional data centers. In 2014, Alert Logic found that attacks against both cloud and on-premise infrastructures had increased to nearly equal levels. It became clear that on-premise security protocols weren’t as strong as companies thought after WannaCry ravaged on-premise systems across the globe in 2017. It proved that even your on-premise network are vulnerable to attack, unless you don’t have any machines connected to the Internet. While cloud providers spend more resources on security than other enterprises could probably afford, they can’t account for the customer’s actions. Misconfigured implementations, insecure applications, improper user management, and other customer errors will cause 95% of cloud security failures through 2022, Gartner predicts. We’ve moved beyond questions of which infrastructure is more secure than the other. It’s time to focus on what brings the most value to your enterprise and developing the protocols to secure it properly. Have we changed your perception of cloud security? Let us know in the comments below!